The dark fantasy series from Nathan Edmondson (WHO IS JAKE ELLIS?, GENESIS) and Konstantin Novosadov returns this October in issue #5 when Winslow’s dreams begin to unravel and his nightmares swiftly surface. Tormented by recurring dreams, Winslow is hunted by mysterious beings and protected by an old traveler. Soon Winslow realizes the power and prophetic nature of his dreams and the danger their knowledge puts him in. Strange entities are after him, and they will not rest until they put a stop to the clues his dreams provide about information that world was meant to forget—even if it means erasing his mind. Comic Bastards calls THE DREAM MERCHANT “amazing to watch,” so don’t miss out on the concluding issues of a personal story that has grown into a wild and epic thriller. 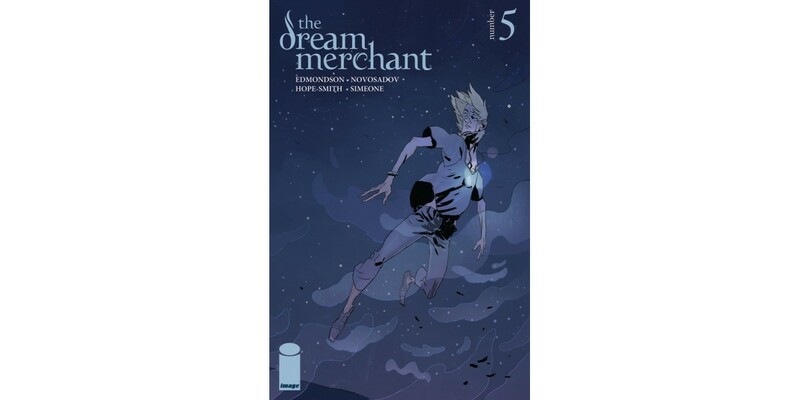 THE DREAM MERCHANT #5 hits stands on October 15. The final order cutoff for retailers is TODAY.